Come to Flappers and Get Happy! 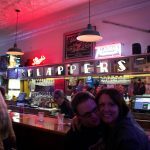 Get Down and Get Happy with Flappers Happy Hour, every Monday through Friday 4pm to 6pm! Get 50 cents off across the board, and $7.00 pitchers of Bud Light, Miller Light and Yuengling! While you’re here, chow down on our Daily Specials!